Homewood-based Operation Better Block proposed a 2,000-lot development project to residents on Wednesday. 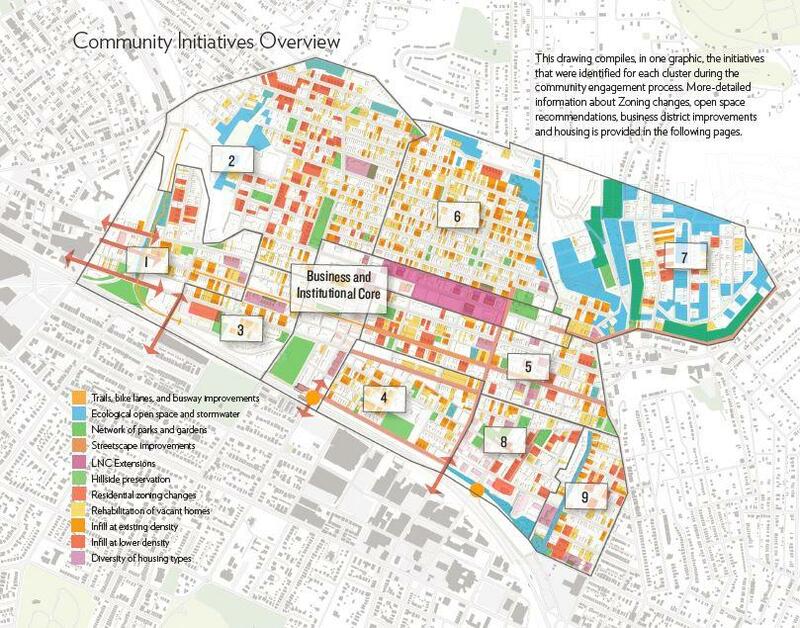 Residents of Homewood heard the results of Operation Better Block’s resident-driven land use plan last week. Demi Kolke, the group's community development manager, said watching the redevelopment boom in nearby neighborhoods like East Liberty made them realize that Homewood could be next. And they wanted to ensure that the community remained involved through the process, as it brings changes to the neighborhood. “So our goal was to kind of get ahead of it and plan with all of the vacant houses, the vacant lots ... talk to residents and plan in the interest of the residents who are there now for future development,” Kolke said. Homewood, a majority black neighborhood, has more than 2,000 vacant lots and 600 empty buildings. Its population now stands at about 6,000 people, about 17 percent of its former high of 35,000. That's why Kolke said Operation Better Block organizers are hoping to make use of those lots for improvements to trails, busways, bike lanes and the streetscape, as well as zoning changes, rehabilitating vacant homes and adding new housing. The organization also worked with Mayor Bill Peduto, the Urban Redevelopment Authority and others. Data for the land use plan was collected from January to June in 2014. Operation Better Block divided the neighborhood into 10 clusters – nine residential and one business. “The great thing about having a cluster plan as opposed to like a typical (plan) where they plan for the entire neighborhood at once is that you can kind of bite off chunks at a time so it's much more feasible, and you can see much more immediate progress than trying to tackle the entire neighborhood at once,” she said. In each cluster they held meetings about the short- and long-term needs. Out of those meetings came development plans, Kolke said. Future collaborations could include urban gardens, different types of watershed projects and infill construction and development. "Doing more ‘green-friendly’ development where you have a little bit bigger of a side yard," she said. The first of these plans to come to fruition will be the construction of infill housing, new homes built where dilapidated and abandoned homes exist. Groundbreaking for the first phase is scheduled for next spring. North Braddock has more than 300 vacant homes, many of which are beyond repair. About 100 of those are not secured, meaning they have doors or windows that are broken or missing. On Saturday, about 40 volunteers plan to fan out in the neighborhood to clean and secure several of the properties. The City of Pittsburgh wants to make it easier for residents to start gardens in the 9,500 vacant lots it owns. City Council on Wednesday gave preliminary approval to a bill that would create the Adopt-a-Lot program within the Department of City Planning. Assistant director of City Planning Andrew Dash said there is currently no formal mechanism for people who want to maintain, beautify or grow food in vacant lots. With plenty of vacant lots and green space, people in the Garfield neighborhood have come up with a plan to revitalize the area. Could tiny homes attract residents and be the key to remaking the area? Joining us to share this vision for Garfield is Rick Swartz, executive director of the Bloomfield-Garfield Corporation.